Christyn Williams, left, was MVP of the McDonald's All American Game after future UConn teammate Olivia Nelson-Ododa stole the show at the Powerade Jam Fest. After the week they've had, the UConn recruits need no introduction. 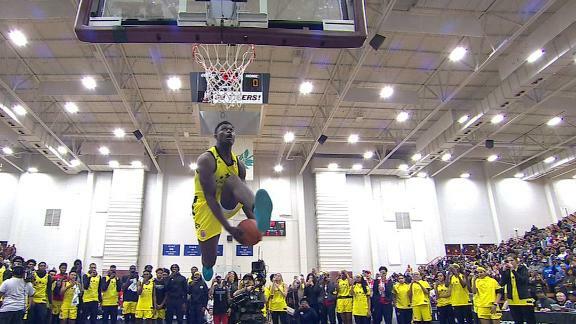 Olivia Nelson-Ododa dunked her way to fame when she rose high and true at the Powerade Jam Fest in Atlanta on Monday night. Christyn Williams shot her way to the MVP award after scoring 22 points and grabbing 12 rebounds in the McDonald's All American Game. It's hard to imagine anyone having a bigger senior season than Williams, who averaged 26.8 points and 10.4 rebounds as a senior and led Central Arkansas Christian (Little Rock) to a state title. 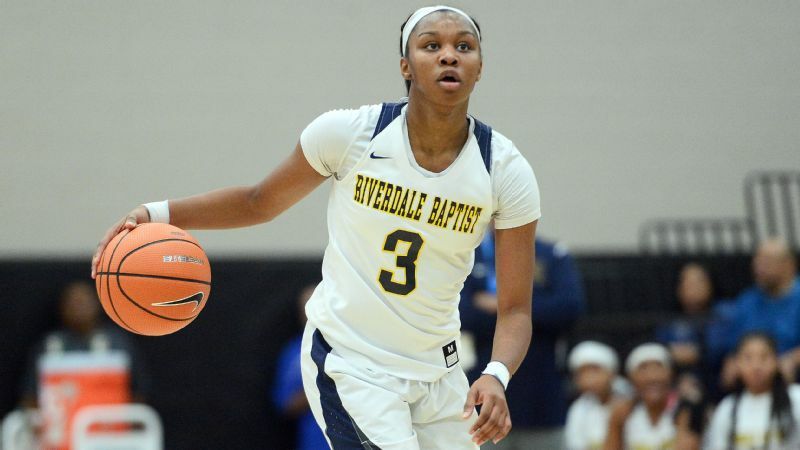 The 5-11 guard was named the Women's Basketball Coaches Association's Player of the Year, the Naismith Player of the Year, the Morgan Wootten Player of the Year and the Gatorade National Player of the Year. The country may have learned about Nelson-Ododa on Monday, but Georgia has known about the 6-4 versatile post player for years. She averaged 19 points, 16 rebounds, six blocks shots, three assists and two steals as a senior at Winder-Barrow. She was named the The Atlanta Journal-Constitution player of the year. 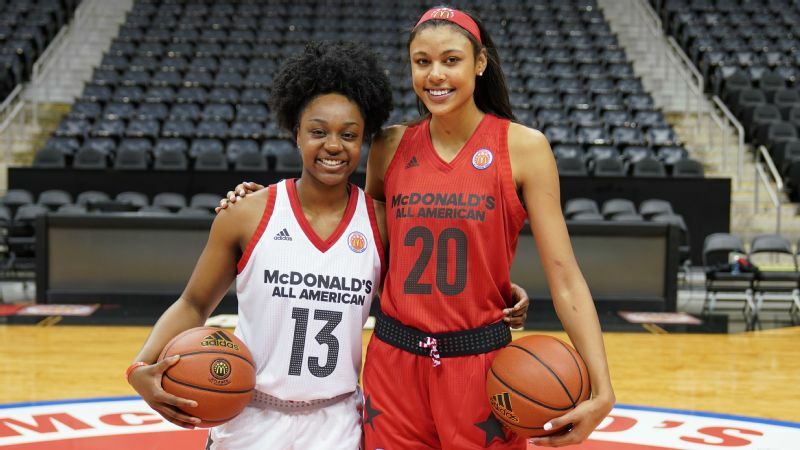 Like UConn coach Geno Auriemma, Notre Dame's Muffet McGraw had a pair of recruits at the McDonald's All American Game on Wednesday night. We'll start with Jordan Nixon, who looked like a coach's dream with five assists and five rebounds in 17 minutes at the annual showcase. The 5-8 point guard from Mary Louis (Bronx, New York) was named Miss New York Basketball for 2018. Katlyn Gilbert, a 5-10 point guard at Heritage Christian (Indianapolis), also had a strong showing at McDonald's and finished with seven points, including a 3-pointer, and three assists in 17 minutes. 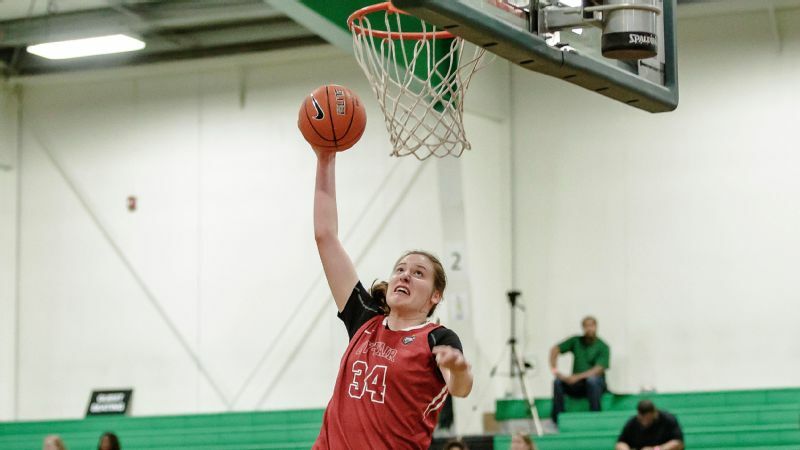 Danielle Cosgrove, a 6-3 post, was slowed at the start of the season with a knee injury but came back and starred for Sachem East (Farmingville, New York). Abby Prohaska, a 5-10 guard at Lakota West (West Chester, Ohio), averaged 15 points and was named to Ohio's all-state team. Coach Jeff Walz has landed a three-player class featuring three in-state stars. Seygan Robins, a 5-10 guard, was named Miss Kentucky Basketball after leading Mercer County to its second straight state title. Robins, also the Gatorade Player of the Year in Kentucky, heads to the Cards with more than 2,500 points, 800 assists and 500 steals in high school. Mykasa Robinson averaged 17.4 points per game during her senior season at Ashland (Kentucky). Molly Lockhart averaged 12.4 points per game at Butler. All three were named all-state by the Lexington Herald-Leader. Coach Vic Schaefer is losing a senior class -- Victoria Vivians, Morgan William and Blair Schaefer -- that will be talked about for as long as the game is played. A four-player class is coming in aiming to keep the momentum going. Xaria Wiggins, a 6-1 wing, will bring a whole lot of know-how when it comes to winning. She will graduate from a Princess Anne (Virginia Beach) program that has won five straight Virginia state titles. Daphane White, a 6-5 versatile post player at St. Martin (Ocean Springs, Mississippi), averaged 25.8 points, 14.7 rebounds and 5.7 blocks per game as a senior. Mixed in there was a 69-point performance in December. Then there's Jessika Carter, who averaged 20 points and 12 rebounds during her senior season at Harris County (Hamilton, Georiga). Brittany Davis, a 5-8 guard, will come in on a high note after scoring 30 points in the final to lift Greenville to a Georgia state championship.